A long time ago in a galaxy far, far away… well, you know the rest. To celebrate the new generation of the Star Wars universe, Nixon has released its second entry into the Nixon Dark Side Collection. The new range comprises custom-built watches and accessories inspired three of the original franchise’s biggest villains: Darth Vader, the Stormtroopers and Boba Fett. Based on the most notorious bounty hunter in the galaxy, the Boba Fett set includes two watches, two wallets, a backpack and a belt, all in the olive green hues of Fett’s armour. 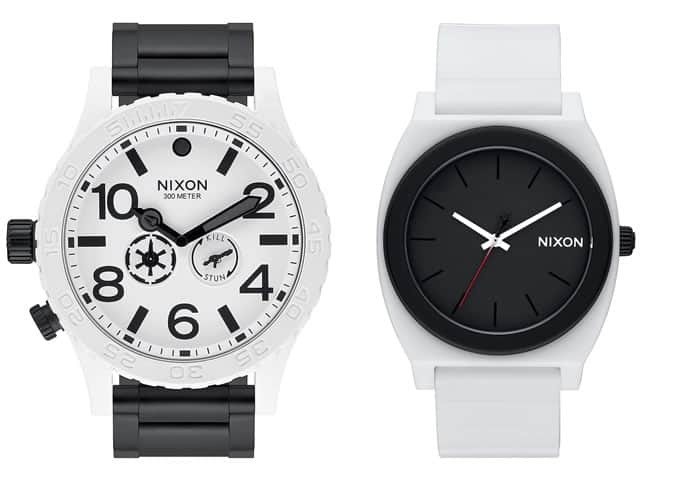 Meanwhile, the Stormtrooper set has been inspired by the uniform they wear and includes striking black and white takes on some of Nixon’s most popular watch models, including the Time Teller P and Ranger 40mm. However, for the ultimate dark side of the Force, steer toward the Darth Vader set, which includes five watches, two wallets, a backpack and a belt, all in deep black. Nixon x Star Wars – Part II is the second of four exclusive collections honouring the iconic films, their characters and their legacy. In Spring 2016, the collab will turn to the other side of the Force for sets inspired by the Jedi, Rebel Pilots, Droids and the Millennium Falcon. The collection is now available at selected retailers, Nixon stores globally and Nixon.com.